Crispy roasted potatoes, topped with melting cheese and plenty of crisp bacon are a great side dish (or main dish!) for any meal. I’ve served these potatoes with eggs for breakfast and with herb roasted chicken for dinner. 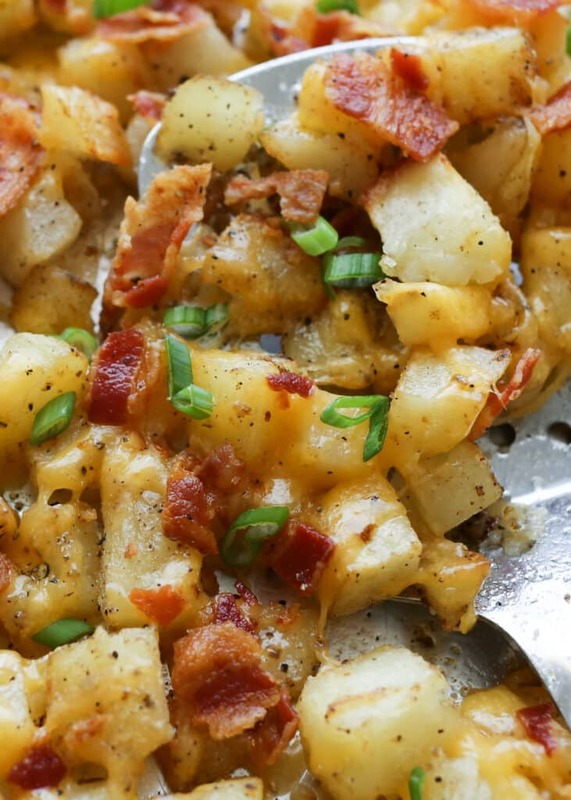 However you serve these cheesy potatoes, there is never a bite leftover. The secret to this potato recipe is an extra long roasting time and a good drizzling of bacon grease. 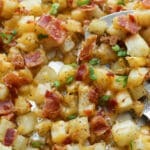 The smoky bacon flavor is in every bite and the extra minutes in the oven leave the edges of each potato nice and crisp with a fluffy center. The recipe is really quite simple, despite the extra time in the oven. Luckily, there is very little actual work involved, making this my kind of recipe! I’ve served these potatoes on their own as a main dish for breakfast, lunch, and dinner. Yes, we really do love these Cheesy Potatoes THAT much and make them often. These potatoes are amazing as a side dish for Oven Baked Crispy Chicken. Start the potatoes first, then prep the chicken. Add the chicken to the oven on a separate rack. Then just carry on with the potato recipe as the chicken cooks on its own. With a salad or some simple steamed vegetables on the side, it’s a feast. Love this recipe? Check out The Weekday Lunches & Breakfasts Cookbook for more fantastic recipes to simplify your meal times! Available in stores and online now. Looking for more recipes to satisfy your cravings for cheese and bacon? Try this Creamy Cauliflower ‘n Cheese with Bacon or these Bacon Cheeseburger Meatballs. I simply can’t have enough potato recipes. We’ve been making these Cheesy Potatoes for a while now, but we also make these Rosemary Roasted Potatoes and the Roasted Fingerling Potatoes regularly. Side note: if you haven’t tried fingerling potatoes yet, put them on your grocery list now. Nothing beats that crisp skin and fluffy interior in a bite-size potato. 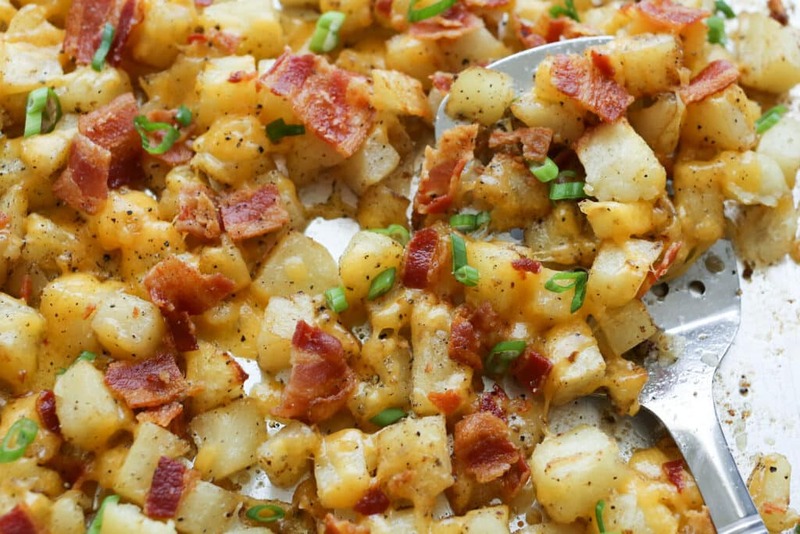 I have a weakness for Jojo Potatoes and I can hardly wait to make this Copykat recipe at home. These Asiago Potato Stacks by A Family Feast need to happen soon as well. If you’re looking for a potato based main dish, these BBQ Chicken Stuffed Potatoes are a hit every time we serve them. And these Sheet Pan Chicken Thighs with Potatoes and Green Beans are a family favorite. COOK THE BACON: Spread the bacon strips out across a large rimmed baking sheet pan and place on the middle rack of a COLD oven. Set the temperature to 400 degrees. Set a timer for 16 minutes and check the bacon. Remove it from the oven when it is as crisp or crunchy as you like. Put the potatoes on the pan and toss with tongs to thoroughly coat them in the bacon grease. Sprinkle with salt and pepper. Spread the potatoes out in a single layer and bake for 20 minutes, stir well with a spatula and bake an additional 20 minutes. Stir again, making sure that none of the potatoes are sticking to the tray. Bake another 15 minutes. Chop the bacon into small pieces. Remove the potatoes from the oven, stir again and sprinkle generously with shredded cheese and chopped bacon. Return the tray to the oven and bake an additional 2-3 minutes, until the cheese has melted. Top with sliced green onions just before serving. COOK THE POTATOES: While the bacon is cooking, peel and chop the potatoes. Transfer the bacon to a paper towel lined plate to drain. There should be 2-3 tablespoons of bacon grease left on the sheet pan. (If there is more than that, drain off a bit.) Put the potatoes on the pan and toss with tongs to thoroughly coat them in the bacon grease. Sprinkle with salt and pepper. Spread the potatoes out in a single layer and bake for 20 minutes, stir well and bake an additional 20 minutes. Stir again, making sure that none of the potatoes are sticking to the tray. Bake another 15 minutes. Chop the bacon into small pieces. Remove the potatoes from the oven, stir again and sprinkle generously with shredded cheese and chopped bacon. Return the tray to the oven and bake an additional 2-3 minutes, until the cheese has melted. Top with sliced green onions just before serving. Enjoy! Can we use. Hash. Browns to shortened the cooking time? But follow the rest of the recipe. I imagine that will work fine, however I can't speak to the exact timing with that substitution. If you watch the oven closely, you should be able to make it work out. Enjoy! Making this today for a brunch! Cant wait to find out how my guests like or love it!! This looks like something really fun to serve for a big family breakfast over the holidays! 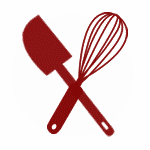 We are always looking for new ideas that can be made gluten free. I love this! What temperature do you cook the potatoes? You stated 400 degrees for the bacon but that seems high for the length of time you cook the potatoes. I bake them at 400 degrees.